A student of the Department of Mass Communication, Chukwuemeka Odumegwu University (COOU), Ezinne Okeke, has received award as the best student in creative advertising in the 2018 session. 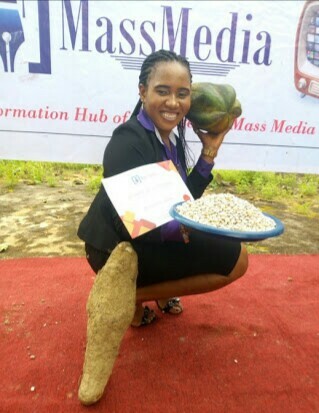 Okeke was given 18 cups of beans, pawpaw and one yam tuber as prize for the award, including a certificate of excellence. She led a team that produced an outstanding poster on a fruit juice brand which was selected as the best by a number of judges who assessed a creative advert competition involving 150 students. Okeke was the creative concept originator in her team, making her outstanding amongst others. The award was organised by Mass Media NG, an online news platform that celebrates excellence in communication education especially among students. Congrats, and enjoy your award's dividends.